6 Because while we were still helpless, at just the right time Christ died on behalf of the ungodly. 7 (Because rarely will anyone die even on behalf of a righteous person, though someone might possibly dare to die for a good person, perhaps). 8 But God proves his own love for us, in that while we were still sinners, Christ died for us. 9 So he did so much more, because we have now been declared righteous by his blood, we will be saved by him from God’s wrath. 10 For if while we were his enemies we were reconciled to God through the death of his Son, how much more, since we have been reconciled, will we be saved by his life? 11 Not only this, but we also delight in God through our Lord Jesus Christ, by whom we have now received this reconciliation. Growing up in Rural Florida, I encountered many symbols of the Easter holiday. Some of these were symbols which had more to do with the fact that Easter happens in the Spring in the U.S.A. So new clothes and fresh flowers were prominent. 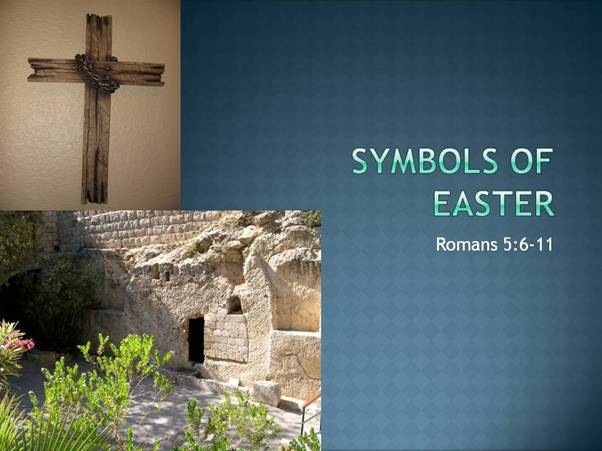 Other symbols had some loose connection to the biblical Easter story, like lambs and palm branches, or maybe a connection to the idea of resurrection, like butterflies. But mostly as a child I remembered Easter because of Easter bunnies and Easter egg colouring, and Easter egg hunts. As I grew older, I came to see that behind the rituals and the festivities of Easter, there is a story that needs to be told. It is not a story that is tied to any particular season of the year, or any date on the calendar. Easter marks an event of unimaginable significance. So, as the apostle Paul shows in today’s text, Easter is a celebration of something that Christ Jesus did for us. Verse six says that while we were still helpless, Christ died on the cross for the ungodly. Only he could pay the penalty because God required a sinless sacrifice, but none of us qualified. So, God sent his only Son to die on our behalf. The Easter message is a love story. It is not a story about how much we love God. It is a story about how much God loves us – all of us. So, God did not wait until some of his people started acting more holy, or more mature, or more righteous. He sent his Son into a world that would abuse him, rebel against him, betray him and crucify him. That is love. It is love when you want another person’s welfare so much that you are willing to put your welfare in danger for the person you love. That is what Jesus did for us. It is ironic that most of the world is still looking for proof that God is real and that he loves them. The cross did that. Easter makes two theological declarations. First, what Jesus did on the cross declares that those putting their trust in him are right now righteous in God’s sight. It does not matter how much we have sinned. It does not matter how much we have rebelled. It does not matter how far we have transgressed. The blood of Christ has cleaned all of that up. Secondly, what Jesus did on the cross declares that whereas we were once enemies of God, now we are reconciled to him. Our relationship to God has changed. This happened before we came to Christ, or even knew that there was such a person as Christ. It happened at the cross. So, if you are wandering what it would take for God to stop being your enemy, look no further. The cross is all it took, and that happened on the first Easter. But the Easter message goes beyond that, because we need more that just forgiveness and reconciliation. Humanity has been cursed with mortality and death, so we need a salvation that overcomes death. That is why it was not just important that Christ die on the cross. He also had to be raised and come out of the tomb. His present immortal life is God’s promise that death will not be the last word in our lives. Easter celebrates the fact that Jesus Christ is the firstfruits. The firstfruits is the first part of the harvest. When the ancient Israelites celebrated the firstfruits, they were declaring that they trusted God for the rest of the harvest. When we celebrate Christ’s resurrection, we are declaring that we trust God for our own resurrection when Christ returns. The Easter message also promises a new and different kind of life – a life saved from God’s wrath. It does not promise that we will not die. Jesus died. What it promises is that once we are raised, like Christ was, we will never die again. We are not just saved from the consequences of Adam’s sin. We will also be saved from the consequences of our own sins. Those sins deserve God’s wrath. They deserve the second death in Gehenna hell. But Christ’s resurrection is God’s way of telling us what we have in store. We are going to be raised like Christ was. He was raised immortal, never to die again. So, join me today in celebrating two symbols of Easter– the symbols of death. That sounds like a strange request, but there is wisdom in it. God took those two symbols, and he gave new meaning to them. The cross was a symbol of cruelty, torture and death. Now it is a symbol of hope and grace. The tomb was a symbol of despair and inevitable disintegration. Jesus changed the tomb’s meaning by getting up on Sunday morning and walking out of it. Now there is hope. Now there is a chance for life after death. Now there is a future beyond the grave for us. That is something worth celebrating. This message was given by Jefferson Vann on Easter Sunday, 5th of April, 2015 at Parawai Church of Christ, Thames, New Zealand. This entry was posted in sermon, sermon-archive and tagged Parawai Church of Christ. Bookmark the permalink.